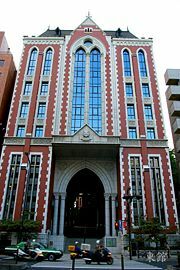 Keio University (慶應義塾大学, Keiō Gijuku Daigaku), located in Minato, Tokyo, Japan, is one of the most prestigious universities in Japan. It is also the oldest university in Japan, established originally as a school for Western studies in 1858 in Edo (now Tokyo) by founder Fukuzawa Yukichi. During the 1860s, Fukuzawa visited Europe and the United States several times, and came to believe that revolutionary changes in attitude and education were essential for the progress of Japan. He implemented his ideas, teaching Western studies and political economy, at his school Keio Gijuku. Fukuzawa emphasized equal opportunity, and believed that education was the key to greatness. He accepted increasing numbers of private students from lower-class families and added foreign instructors to his faculty. Keio established itself as a university in 1890, but did not receive official accreditation from the Japanese government until 1919. It served as an alternative to the nationalistic and authoritarian government-sponsored universities, fostering free inquiry and producing a number of leaders in banking, industry and the private sector. Today Keio Gijuku Daigaku includes undergraduate faculties of Business and Commerce, Economics, Environmental Information, Law, Letters, Policy Management, and Science and Technology; a School of Medicine and several graduate schools. It is part of a network of elementary and junior and senior high schools. Many research institutions, including the Institute of Cultural and Linguistic Studies, are associated with the university. Keio’s founder, Yukichi Fukuzawa, believed that Japan could prosper in the modern world only if it would "always strive for progress and enlightenment, and provide the academic and moral education needed to create a generation of wise and capable leaders." 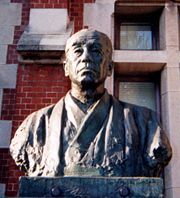 Fukuzawa's intention was to foster free inquiry and create an alternative to the nationalistic and authoritarian government-controlled universities. 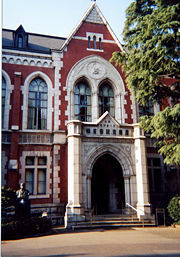 Keio was not officially accredited as a university by the Japanese Ministry of Education until 1919. Without state supervision, it was able to provide a freer academic environment, with greater emphasis on individual development, than government-sponsored schools such as the University of Tokyo. Since opportunities in government service have been largely confined to graduates of government universities, Keio has emphasized studies such as business and law, and has produced many leaders in banking and industry. Taking its inspiration from Fukuzawa's spirit of "independence and self respect," Keio University has been a constant source of innovation since its foundation in 1858, and has provided intellectual leadership in a wide variety of fields. In 2008, Keio University was the first modern comprehensive educational institution in Japan to celebrate its 150th anniversary. Keio was founded in 1858 by Yukichi Fukuzawa, one of modern Japan's first statesmen. Yukichi Fukuzawa, who is portrayed on Japan's 10,000-yen note, is best known for introducing Western education, institutions, and social thought to Japan. When the United States fleet arrived in Japan in the summer of 1853, Fukuzawa who was just 18 years old, was sent by his clan to Nagasaki, home of the Dutch trading enclave, to study Dutch and Western military technology. In 1858, he was appointed official Dutch teacher of his family's domain, Nakatsu, and was sent to Edo to establish a school for the family's vassals there. In 1860, Fukuzawa accompanied a Japanese delegation to the United States, and in 1862, he visited England, France, Germany, Holland, Portugal, and Russia as translator for a Tokugawa embassy to Europe. In 1867, he returned to the United States as an envoy for the Japanese government, visiting Washington D.C., Philadelphia, and New York. His personal aim was to acquire textbooks to take back with him to Japan, and he went to Brown University to learn about the Western educational system. Fukuzawa realized that technical progress had made Western countries more prosperous, and he came to believe that revolutionary changes in attitude and education were essential for the progress of Japan. After his return from the United States, he created his own school to implement his ideas, a private school of Western studies called Keio Gijuku. By 1867, more than 100 students were enrolled in Keio Gijuku, with Fukuzawa lecturing primarily on political economy. Fukuzawa soon began bringing faculty from overseas to teach his students. Over the next two decades, Keio Gijuku gradually accepted increasing numbers of private students from lower-class families, and introduced mathematics, economics, medicine, and other subjects. In 1871, the school moved to Mita, the current site of Keio University's main campus. In 1874, Keio Yochisha Elementary School was established. Between 1872 and 1876, Fukuzawa published 17 volumes of Gakumon no Susume ("An Encouragement of Learning" or more literally "of Studying"), emphasizing equal opportunity, and education as the key to greatness. Fukuzawa hoped to instill a sense of personal strength among the people of Japan. He believed that Western countries had become powerful because they fostered education, individualism (independence), competition, and exchange of ideas. In 1890, Keiō established its first university faculty with Departments of Law, Literature (presently Faculty of Letters), and Economics. In 1898, it became a comprehensive educational institution with college, secondary and elementary schools. In 1899, it became the first private university in Japan to send students abroad, four to Germany, two to the United States. A School of Medicine was established in 1917, and in 1920, Keio University was one of the first private universities accredited by the Japanese government. Keiō became coeducational in 1947. A business school was established in 1962, and the Faculty of Engineering was reorganized and expanded into the Faculty of Science and Technology in 1981. This was followed by the establishment of faculties of Policy Management and Environmental Information (1990), a faculty of Nursing and Medical Care (2001), a Department of Biosciences & Informatics (2002), Law School (2004), and a faculty of Pharmacy (2008), as well as the establishment of a number of graduate schools. Its baseball team plays in the Tokyo Big Six league. The main campus is in Mita, Tokyo. Additional campuses include Hiyoshi, Shinanomachi, Shonan Fujisawa Campus (SFC) designed by Fumihiko Maki, Tsuruoka Town Campus of Keio (TTCK), and Yagami. The university also operates a network of elementary, junior and senior high schools. ↑ Keio University, International Initiatives. Retrieved October 12, 2008. ↑ Keio University, Keio Founder Yukichi Fukuzawa. Retrieved October 12, 2008. ↑ Yukichi Fukuzawa, Gakumon no Susume [An Encouragement of Learning] (1872). Craig, Albert M. Civilization and Enlightenment: The Early Thought of Fukuzawa Yukichi. Cambridge, Mass: Harvard University Press. 2009. ISBN 9780674031081. Hopper, Helen M. Fukuzawa Yukichi: From Samurai to Capitalist. New York: Pearson/Longman. 2004. ISBN 0321078020. Keiō Gijuku Daigaku. A Pictorial History of Keio University, 1858-1958. Tokyo: Keio University, 1959. Kiyooka, Eiichi, Kazuyoshi Nakayama, and Albert M. Craig. Birth of the University Section in Keio Gijuku: From New Materials Found in Harvard University. Tokyo: Keio University, 1983. This page was last modified on 15 April 2018, at 20:42.